The Jellyfish Barge project was coordinated by a multidisciplinary team consists of Professor Stefano Mancuso (University of Florence), director of the International Laboratory of Plant Neurobiology (LINV), and executed by by the architects Antonio Girardi and Cristiana Favretto from Studiomobile. 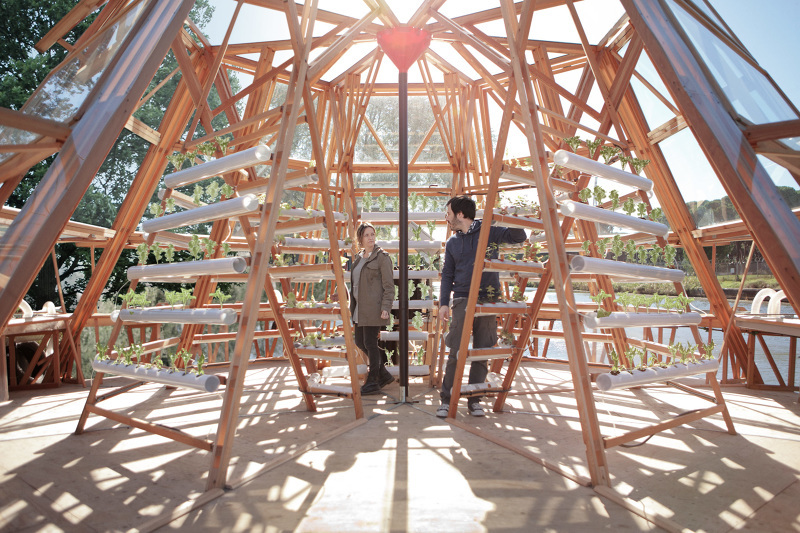 Constructed with wood and recycled materials, this lightweight greenhouse relies primarily on solar energy to bring an affordable and easy-to-build solution to communities vulnerable to water and food scarcity. 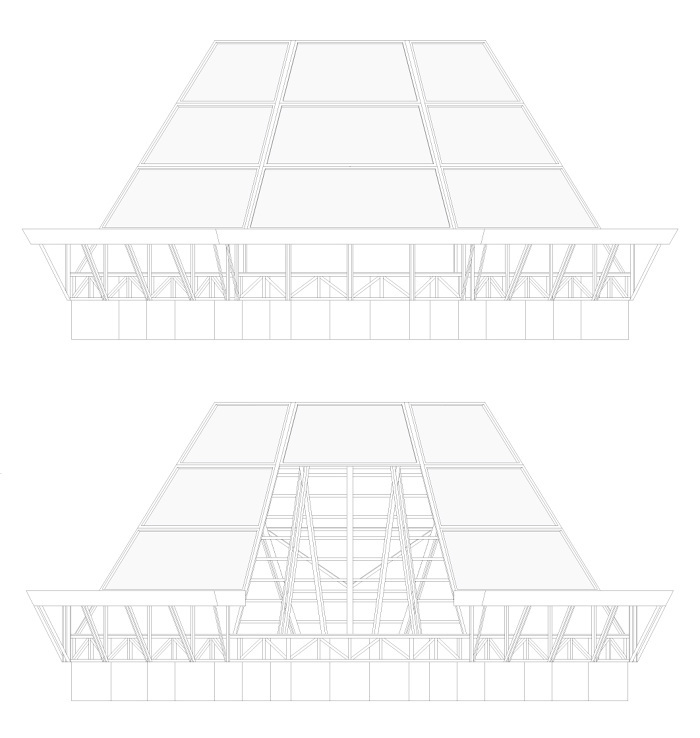 Adaptability was also a concern for the architects, so they incorporated a means of extending the greenhouse into several connected units. 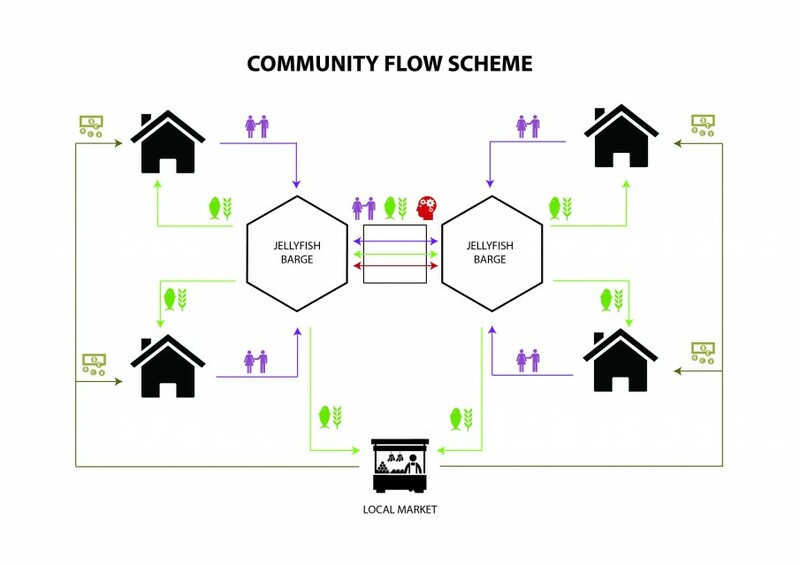 It is estimated that a single Jellyfish Barge will be capable of supporting two families, and can also be easily expanded with additional modules to support a larger community. 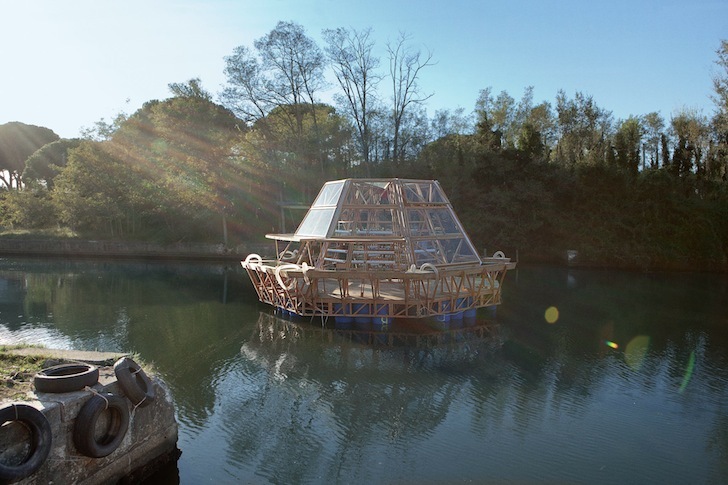 One Jellyfish Barge consists of a wooden base about 70 square meters that floats atop 96 recycled plastic drums. Inside the greenhouse, a high-efficiency hydroponic cultivation method provides up to 70% of water savings compared to traditional crops cultivating systems. The crops are watered with distilled water by seven solar stills that have been designed by the environmental scientist Paolo Franceschetti. 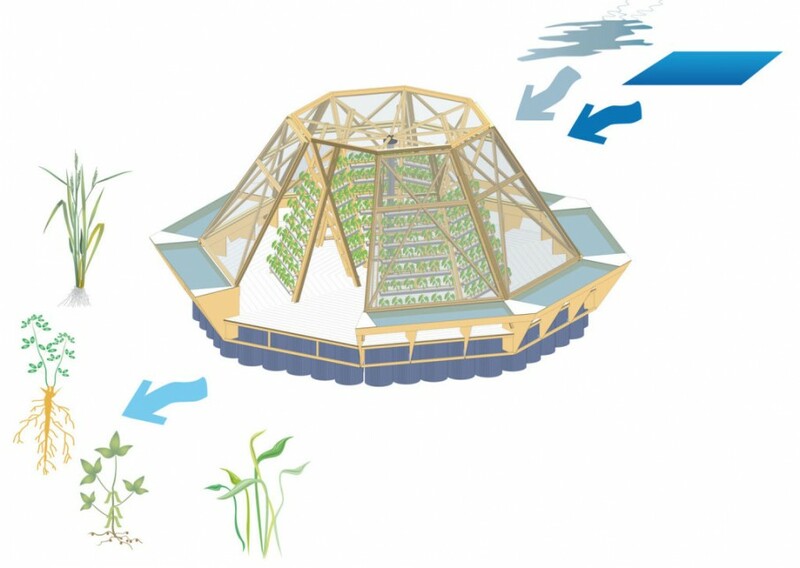 The solar stills are capable of producing 150 liters of clean water a day, mixed with 15% of nutrient-rich seawater to water the crops creates a greater efficiency. 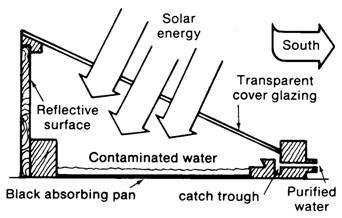 Solar distillation is a natural phenomenon: in the seas, the sun's energy evaporates water, which then falls as rain water. The solar desalination system of Jellyfish Barge replicates this phenomenon on a smaller scale, sucking in moist air and forcing it to condense within the drums in contact with the cold surface of the sea. 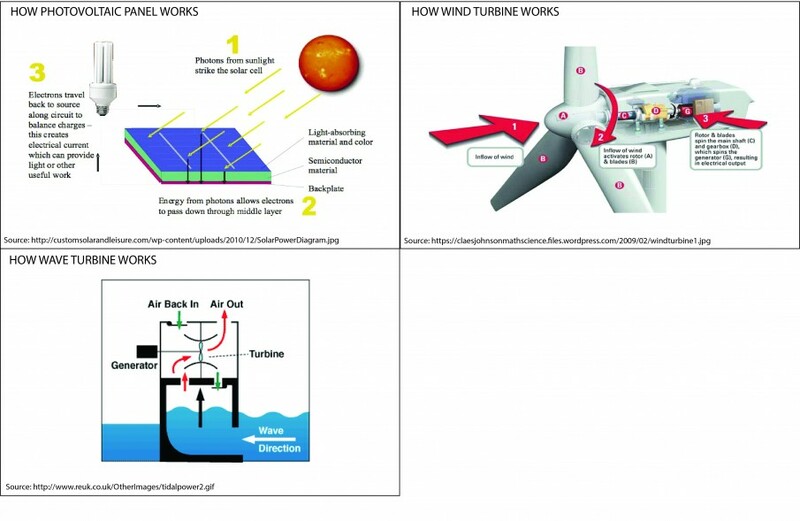 The only energy required to power fans and pumps is provided by photovoltaic panels, mini wind turbines and an innovative system that exploits waves into electricity. The whole system can be controlled remotely, streamlining the food-growing process into a simpler and more productive activity. The World Bank predicts that the world population will grow to almost 10 billion in the next four decades. By 2050, the global demand for food is expected to be 60-70% higher than today. Scarcity of clean water and cultivable land are the main obstacles to meet the quantitative and qualitative shifts of the world's demand. Therefore, a multidisciplinary team of architects and botanists offers an alternative design solution to this problem. 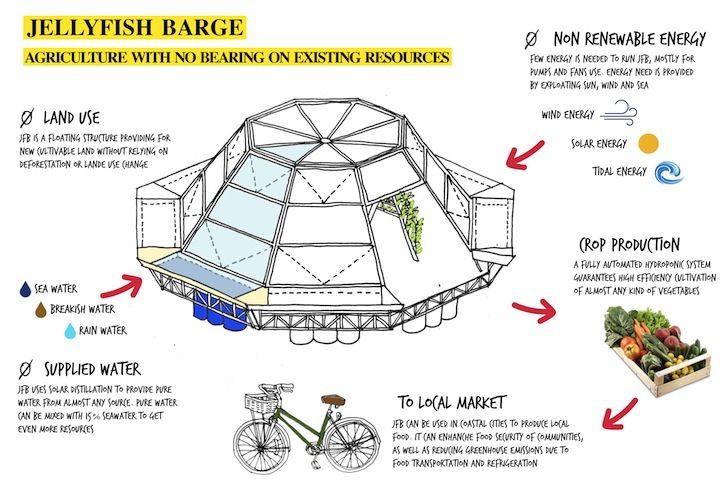 Jellyfish Barge comes from a project by Antonio Girardi and Christiana Favretto from Studiomobile, called Jellyfish Farm, which exploits the seawater desalinisation process to cultivate floating vegetable gardens. The installation is sort of "neo-nature", where recycled objects become an autonomous living organism. 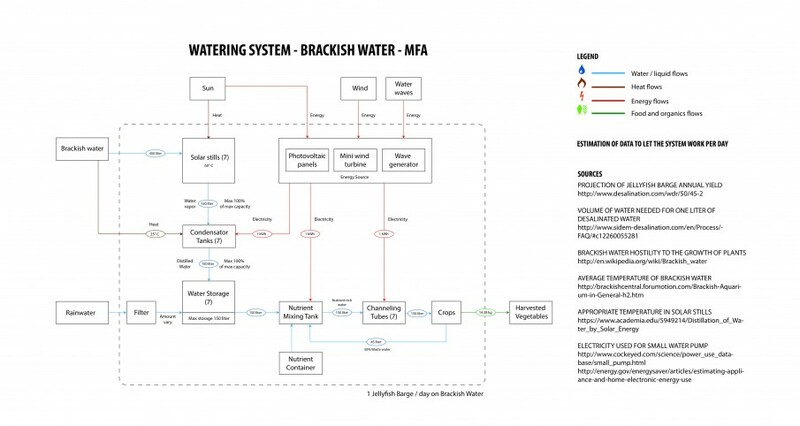 This project is aimed to offer a solution against this food and cultivable land scarcity problem in the near future by creating an alternative of self-sufficient, not land-based farming system. 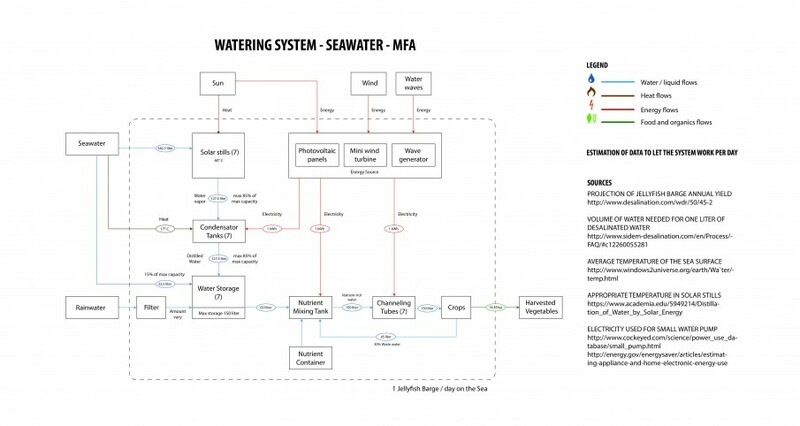 The working prototype was realised by LINV (University of Florence) with the contribution of the Fondazione Cassa di Risparmio di Firenze and Regione Toscana, has been installed in the Navicelli canal between Pisa and Livorno and had been inaugurated on October 31, 2014 at the headquarters of Navicelli Spa, Pisa. The floating farm has already produced a bumper crop of lettuce and radicchio. 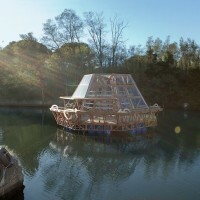 Jellyfish Barge is relatively small in dimension, as it is sized to provide food for about two families. 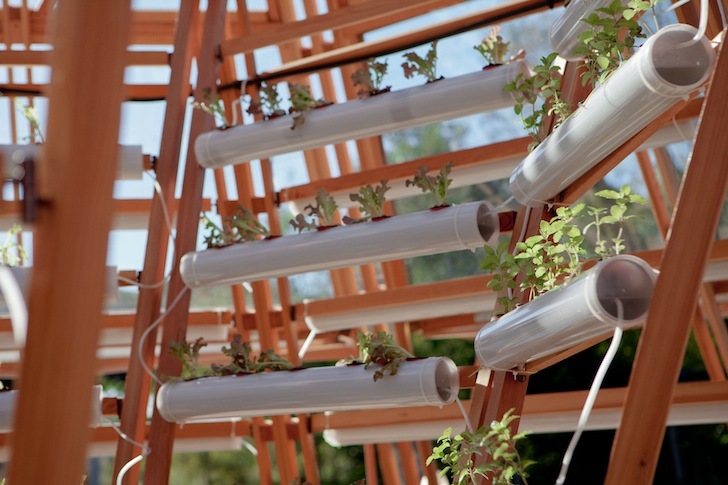 It supports 70 sqm of stacked hydroponic grow racks. 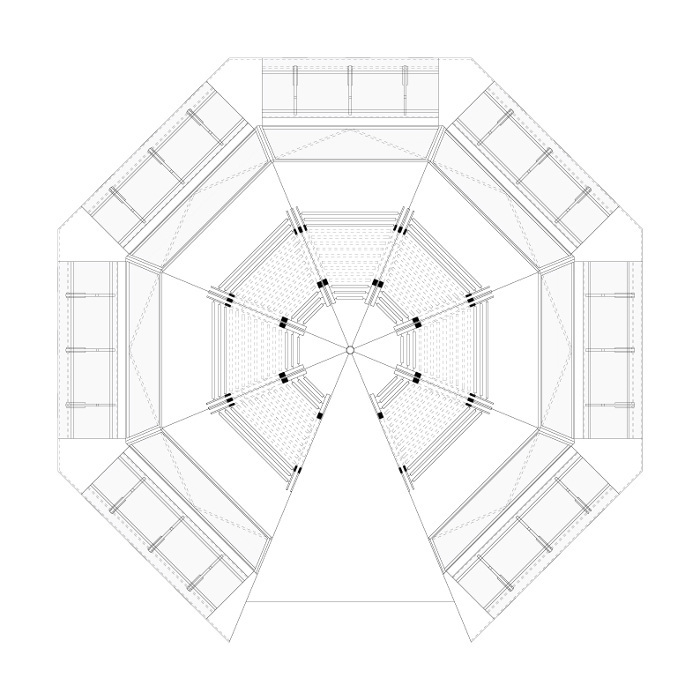 The structure is modular, so a single element is autonomous, while multiple platforms can guarantee food security for a whole community. 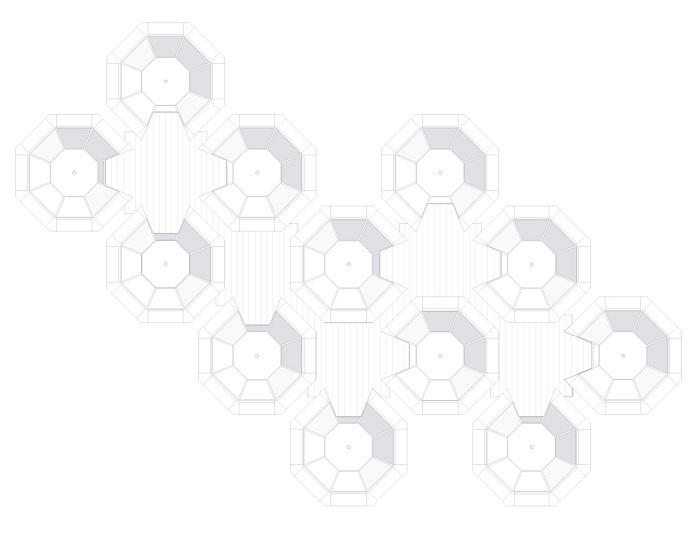 The octagonal shape of the platform allows combining different modules by connecting them with square floating bases, which may become meeting places for a small water community. 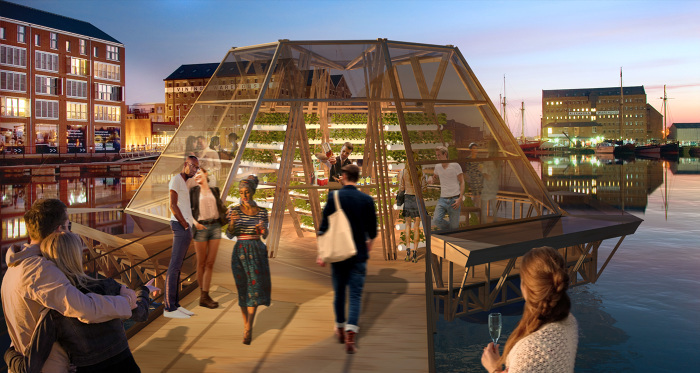 The connection platforms can become outdoor markets, areas for social gathering where to buy, sell, and enjoy crops. 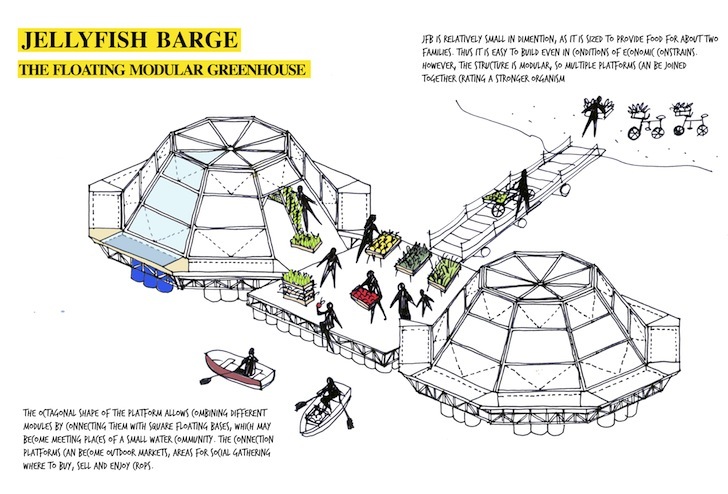 In a future where a good portion of our food ma not be grown on soil, Jellyfish Barge is an engaging design that combines an alternative approaches of food production, creating a possible solution that is powered by renewable energy, addresses the increasing scarcity of arable land, and can drift or be transported to wherever it needs to be. 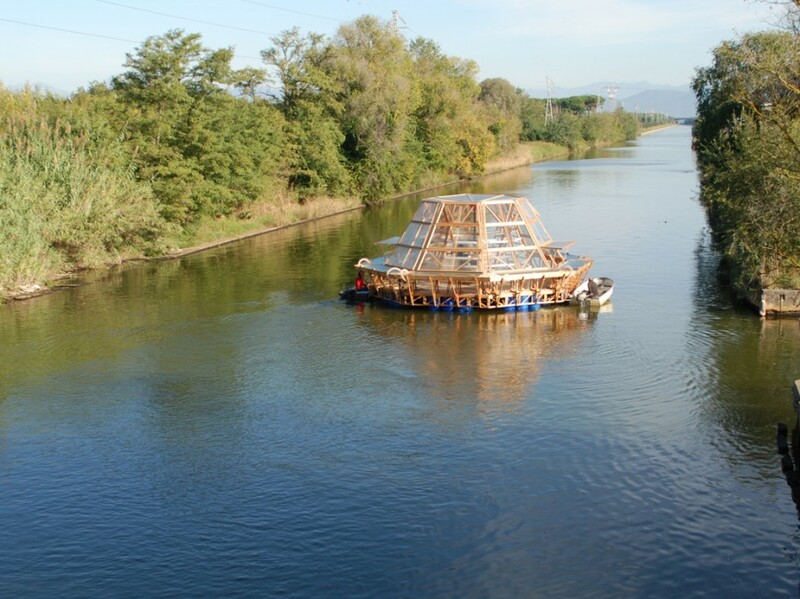 Matteo de Mayda The working prototype, realized by LINV (University of Florence), contributed by Fondazione Cassa di Risparmio di Firenze and Regione Toscana, has been installed in the Navicelli canal between Pisa and Livorno, Italy.